If you like Four Seasons, you will love Shishimaru Grill! Four Seasons is a chain of steak houses popular among locals, foreigners and tourists alike that serves great steaks and seafood at a reasonable price. You can also enjoy a meal that is prepared just for you during the chef's skillful and entertaining performance at the grill. Shishimaru Grill is a branch of the Four Seasons chain serving various kinds of food, including steak, chicken, pasta, fish and more. 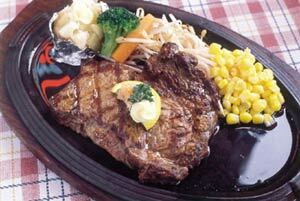 A rib steak set is available for ¥880 at lunchtime and ¥1,000 at dinnertime. Although the chef won't entertain you at the grill as at Four Seasons, they offer good food at reasonable prices in a warm atmosphere, the perfect place to enjoy with friends and family. Shishimaru Grill is also a good choice if you or someone in your party is a vegetarian. Shishimaru Grill is located in Chatan's Hamby area. From the Chatan intersection on Highway 58, head west. You will come to a T-intersection, with a Four Seasons on your left. Turn left and proceed for a quarter mile. You will see a colorful red Shishimaru Grill sign on your right.